If Eugenie C. Scott, the executive director of the National Center for Science Education, were inclined to flaunt her honors, she would be in a good position to do so. 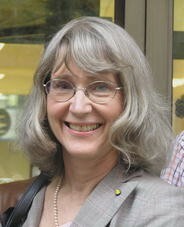 In her twenty-three years at the helm of NCSE, she managed to accumulate a host of awards and prizes, including the American Association for the Advancement of Science’s Scientific Freedom and Responsibility Award, the National Academy of Science’s Public Welfare Medal, and the Society for the Study of Evolution’s first Stephen Jay Gould Prize, as well as honorary degrees from no fewer than eight colleges and universities, all in honor of her efforts to defend the teaching of evolution in the public schools. But as anyone fortunate enough to meet her knows, she is not the sort who puts on airs. Where evolution’s tenacious defender Thomas Henry Huxley was Darwin’s bulldog, Scott likes to describe herself as Darwin’s golden retriever—“kindly, friendly, and confident,” according to the Kennel Club’s standard for the breed. I shouldn’t be calling her Scott, though: to her friends, she’s always Genie. And she has a lot of friends. Among them are the scientists and scholars who have contributed papers to this special issue of Evolution: Education and Outreach in honor of her upcoming sixty-fifth birthday. In academia, it would be called a Festschrift; but let’s not stand on ceremony: it’s a celebration! NCSE is perhaps most famous for organizing resistance to attempts to undermine the teaching of evolution in the public schools—playing, for example, a crucial role in Kitzmiller v. Dover, the 2005 case that established the unconstitutionality of teaching intelligent design creationism in the public schools. But equally important to NCSE, and to Genie, is improving the quality of science education, particularly about evolution and the nature of science. Accordingly, the contributors were asked to explain what teachers need to know in order to teach evolution effectively. And that, after the introduction of Genie by Andrew J. Petto, is exactly what they do. The first quartet of papers discusses the creationism/evolution controversy itself. Nicholas J. Matzke offers a detailed and informative history of creationist movements in the United States. Robert T. Pennock explores the philosophical aspects of the controversy by examining the question of whether students ought to be allowed to opt out of evolution, while Barbara Forrest illuminates how the intelligent design movement, for all its claims of novelty, is recycling the same strategies of the creation science movement. And Raymond Eve, Susan Carol Losh, and Brandon Nzekwe collaborate to provide a perspective on the controversy from the social sciences. Topics in science provide the focus of the next set of papers. Lawrence M. Krauss reviews the latest developments in cosmology and argues that biological evolution and cosmic evolution are crucially, and even inspiringly, connected. Robert M. Hazen provides a primer on the independent yet consistent lines of evidence that establish the age of the earth and determine the dating of important events in its history. And Kevin Padian combines scientific and pedagogical concerns in urging the necessity of teaching about the major transitions in the history of life—“how evolution works in the long run”—for improving the public’s understanding and acceptance of evolution. The final quartet of papers addresses practical classroom matters. Jay Wexler explains the basics of the constitutional and case law relevant to the teaching of evolution in the public schools. Kenneth R. Miller recounts his own experiences facing challenges to evolution in textbooks and offers his encouragement to teachers. Brian J. Alters describes the all-too-common fears of teaching evolution and offers a variety of tried-and-true pedagogical approaches that help to alleviate the problem. And Carl Zimmer discusses how teachers should (and shouldn’t) use media reports on science as a source of supplemental information in their teaching. Genie herself gets the penultimate word, with her reflections on listening to teachers. (It is a measure, perhaps, of her equanimity that, when asked to write a piece for what was described only as “a secret project” on short notice, she cheerfully complied without so much as a murmur.) She concludes, “When it comes to evolution education, we’re all in this together, and we’d better listen to those teachers,” and here she is voicing, I think, the thoughts of all of the contributors to the celebration, all of the editors at Evolution: Education and Outreach, and all of us at NCSE. Finally, Adam M. Goldstein and I have tried to assemble a complete bibliography of Genie’s writings. As Genie observes in her Evolution vs. Creationism (Scott 2009)1, three main themes—which she dubs the pillars of creationism—have pervaded creationist rhetoric from the Scopes trial to the Kitzmiller trial and beyond. It seems appropriate to invert them here. That evolution be appreciated as a vital, unifying, and central principle of science; that evolution be no longer misunderstood as religiously, morally, and socially pernicious; and that it be realized that the integrity of science education requires the teaching of evolution properly, effectively, and without compromise: these are three wishes for Genie. May they come true when she blows out the candles on her next birthday cake. Randy Moore’s review of the second edition of Evolution vs. Creationism, entitled “If You Want to Defend Evolution, Read this Book,” was commissioned for this celebration, but was mistakenly published in the preceding issue, Evolution: Education and Outreach 2010;3(1):128–129. I thank the editors of Evolution: Education and Outreach for the opportunity to organize this special issue, and I am immensely grateful to the authors, the reviewers, and my colleagues at NCSE for their contributions and assistance. My efforts in organizing this celebration in Genie’s honor are only a small token of the esteem and respect in which I hold her.